In my previous post on sentence construction, I share how I use simple melodies to help my students remember the structure of sentences in Present Continuous Tense and 'There is.../ There are...'. 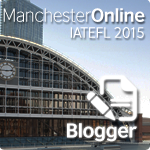 The melodies help the students to remember the structures, and I use this as part of my strategy for scaffolded writing. In this post, I will share more scaffolding activities to help improve sentence construction skills among my weaker learners. I do this activity to help my students remember the vocabulary and phrases that they need in order to construct simple sentences based on a picture. Normally I would provide the words for the 'subjects' and the 'verbs' and the phrases for the 'object' / 'complement' (the 'what/where/who'). Then I get the students to label the pictures using the word cards. 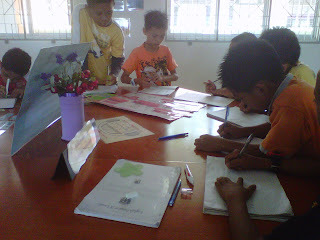 The students will then try to construct sentences based on the pictures, using the words and phrases as their guides. The labelled pictures. 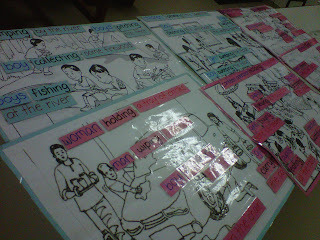 I make them larger so that they can be used for group activities. These are printed on four A4-sized papers, and pasted on manila cards or card boards. I secure everything with large cellophane tapes to make them more durable and long-lasting. 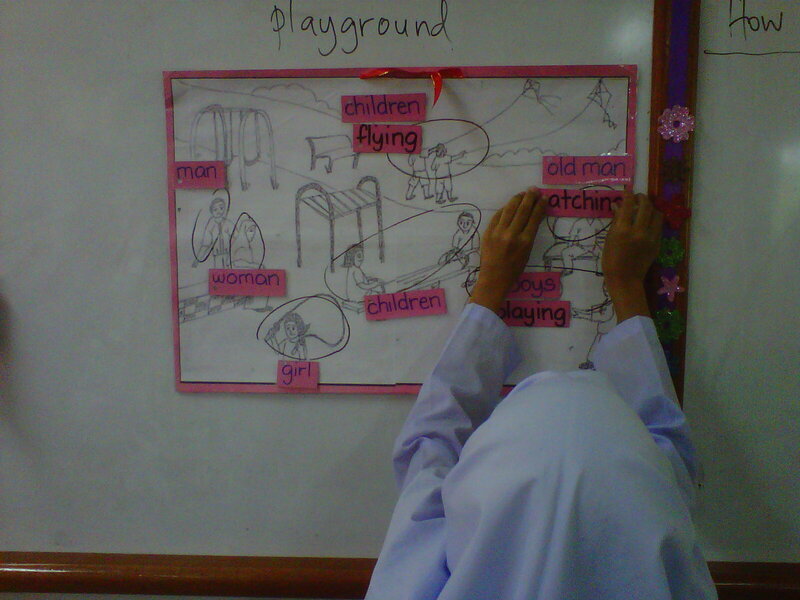 Students write sentences based on the picture, using the words and phrases as their guides. I prefer to carry this out in small groups or in pairs rather than individually, because I think it will be more fun for the students. 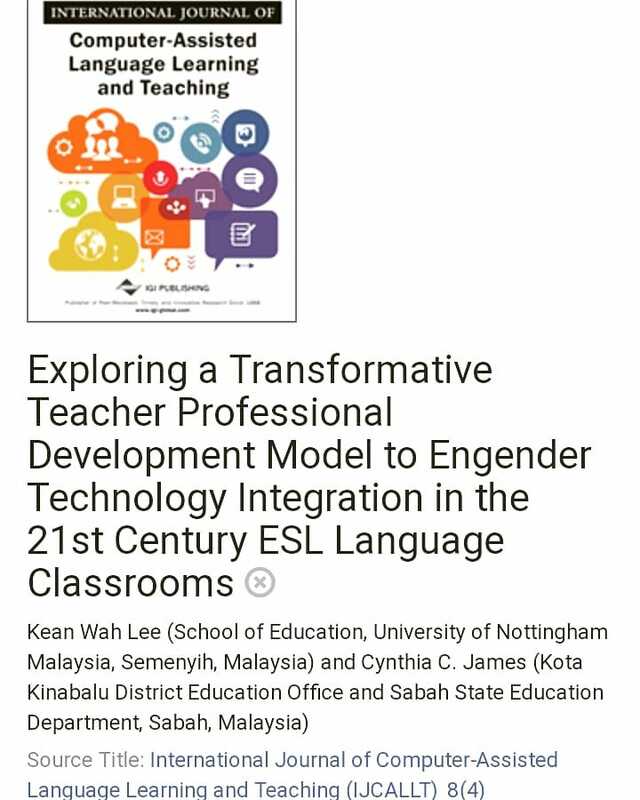 Besides, I think it will give the opportunity for more able learners to help their friends. Each group or pair will get one picture and a set of word cards and phrases. The students match the words and phrases based on what they can see in the picture, and then work together to construct sentences for the picture. Group / pair work - the students write together. 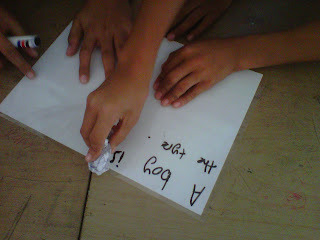 My students love this activity, especially when we turn it into a competition. To do this, I'll have to zoom the different actions / verbs in the large picture, crop them, print them out and then cut them up. Before we do the activity, I'll show the large picture first and we'll review all the vocabulary for the picture. 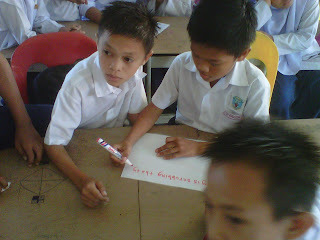 Then, I'll put the students in smaller groups and give each group an envelope containing the word cards for the picture. I'll show the smaller pictures one by one and the students will work together in their groups to arrange the words and form the correct sentences for each of the picture that I show. Groups with the correct sentences will get a point. The group with the most points will win. 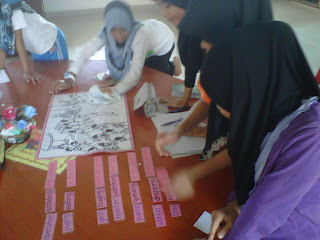 Students look at the picture, and then work together to arrange the words. Students arrange the words to form sentences based on the pictures. 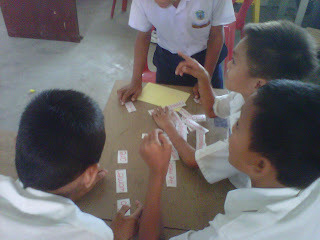 I think this activity is good to help the students remember the vocabulary, particularly the verbs. I also do the activity to help reinforce the students' mastery of the sentence structure. This is also a group writing task. I use the same materials as the ones I use in Activity 3, i.e. 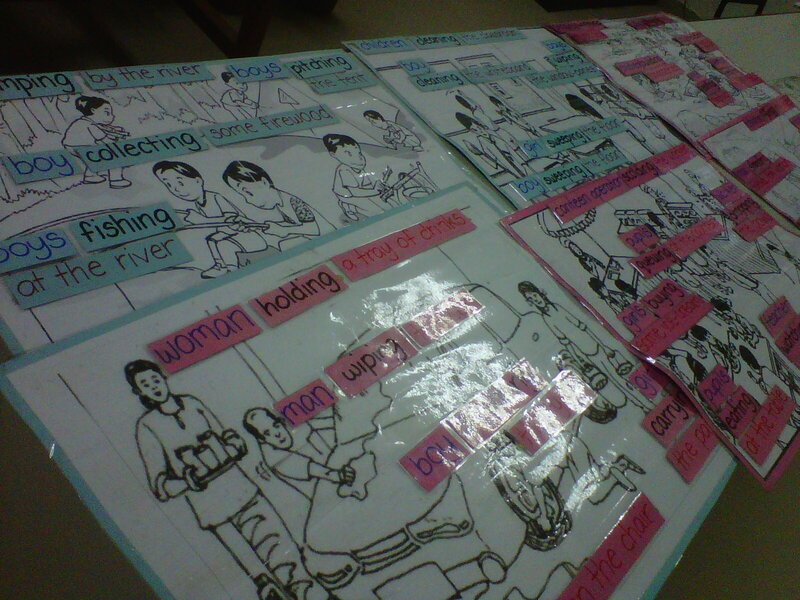 a large picture for review and smaller cut-outs for the group activity. 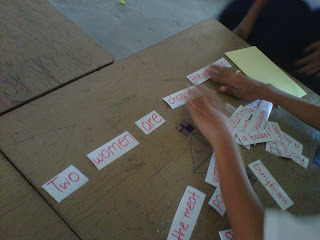 But instead of getting the students to arrange the words, I get them to write the sentences. I laminate a few pieces of white A4-sized papers and use these as 'mini whiteboards' for the students to write their sentences on, using non-permanent / dry-erase markers. The non-permanent / dry-erase markers on the laminated piece of paper can be easily erased using tissue paper or a piece of crumpled paper. The students hold the 'mini whiteboard' up to show the sentence that they've written. 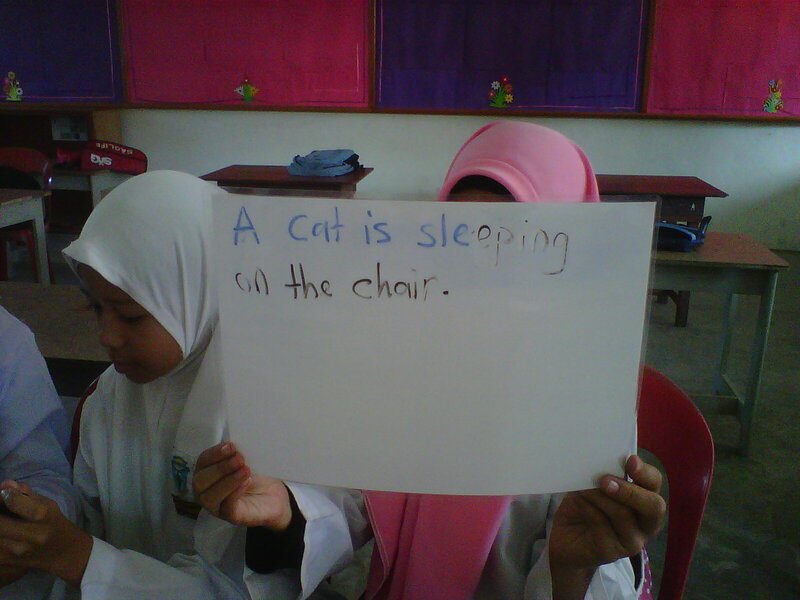 The pair / group with the correct sentence will get a point. I use this activity to help my students who have trouble remembering the sentence structure. First I would do a whole-class review. I like to use my laptop and a projector to display the pictures and the cloze exercises. 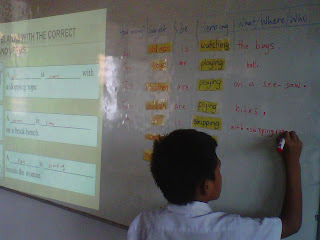 For practice, I get the students to fill in the missing words for the sentences that I project on the board. They can do this by writing on the blank spaces or by putting the correct word cards on the spaces. 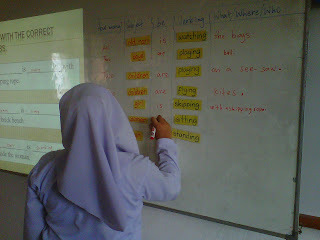 Then, I get the students to transfer the words and phrases into the sentence structure table. This will then be followed-up with individual writing task where I give the students worksheets with similar activities for them to complete. Students transfer the words and phrases into the structure table after completing the cloze exercise. 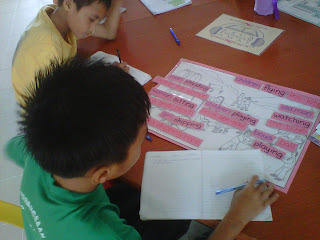 Reviewing the vocabulary and practising the sentence structure. 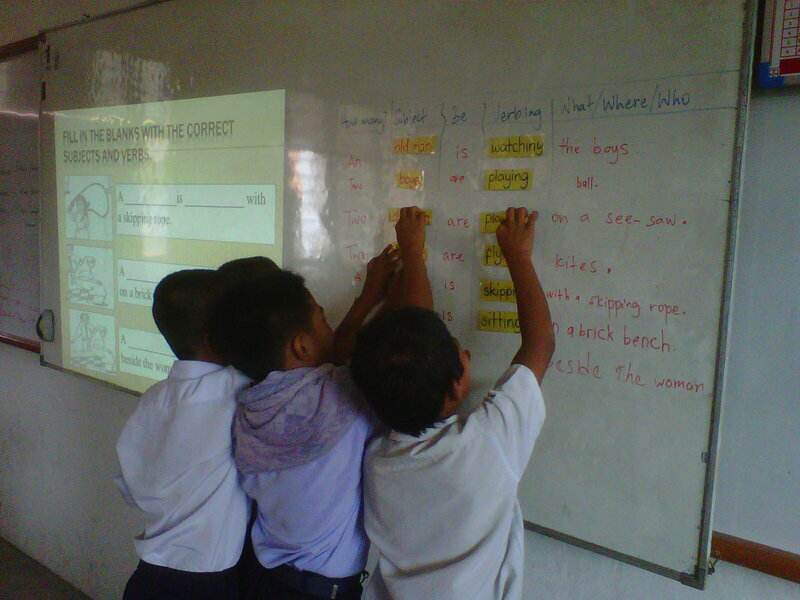 Students work in small groups to review the vocabulary and sentence structure. This post and my previous post on sentence construction focus on sentences in Present Continuous Tense, but the activities that I share here can be used to teach sentence constructions in other tenses and other structures as well. Okay, I think that's all for now. Till the next post.